Greek God villa isolated near the church of Ayios Fokas in Paroikia on Paros5-6 guests, - 3 bedrooms, - 2 bathroomsVilla 'Greek God' is a medium sized villa located in Paroikia on Paros and it can accommodate up to 6 guests. 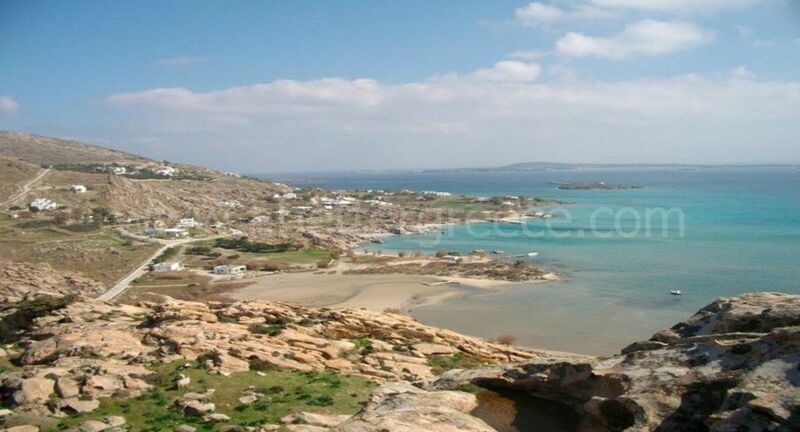 A large independent villa, located in the area of Ayia Irini on Paros. The villa has been built upon 3 levels and offers 4 large bedrooms, 3 bathrooms and a private swimming pool. The villa is independent and very private and only offers high quality relaxing moments! The villa can accommodate 10 people. The Holy Water Villa is situated in Ambelas village a few steps away from the beach. As you approach from the private road to the house there is a large green area covered with grass in the front of the house.Outside the main entrance there is a large covered terrace with a large marble dinner table, and two extra sitting corners with tables and chairs. The views are unlimited over the Aegean. Villa Kavaki heaven, located in Kavaki on ParosThe villa can accommodate 6 - 7 guests as it has 3 large bedrooms and a sofa bed in the second living room.3 bedrooms – 2 bathroomsDESCRIPTION Kavaki heaven villa is located in the area of Kavaki on Paros. Kavaki is on the hill above the town of Paroikia. A very private villa located in the area of Santa Maria, close to Naoussa on Paros.The whole villa is 250 m2 and it has been built upon three levels in a plot of land of 2000 m2. The villa offers a total of 4 private bedrooms and a fifth open space bedroom. A large, luxury villa located in the area of Naousa on Paros, just 2,5 kilometers away from the sea.The villa offers 5 large bedrooms and 3 bathrooms. There is an extra studio with its own entrance that can be used for guests or for staff. The villa can accommodate 10 - 12 people. The living room, kitchen and dining room are fully equipped with modern, comfortable furniture. This Luxury Villa enjoys a unique swimming pool with a large water deck, a built in Jacuzzi and a curbed wall that has stone windows overlooking the bay that provides a different picture frame from each angle that you look. The villa is arranged over a main floor, a lower floor suite and a gallery room. Charming villa of 220 sq comprised of 3 levels ,5 bedrooms, 3 bathrooms with shower & 1 outdoor shower at the entrance of the dwelling. Located in the unit of the 3 villas sharing with villa Lefkes a pool of 115m2. It accommodates up to 10 persons.On the ground-floor we find a beautifully decorated living room with a fireplace and a plasma T.
Aqua jewel villa features a large veranda with outdoors dining area for 8 persons and a lounger under a wooden pergola. There is also a patio with 2 sun beds and a day bed on the side of the house overlooking the country side and the fields.As you enter from the main entrance you come into an open plan space with a dining area for 8 , a living room and a fully equipped kitchen. A large villa that can accommodate 10 people built upon three levels:5 large bedrooms, 3 bathrooms, 2 kitchens, office, store room, Jacuzzi, well kept garden, huge verandas with panoramic sea views.This villa can be rented as one large villa or as two smaller villas as the floors have independent entrances. Large holiday self catering villa located in the area of Parosporos on Paros. The villa is built on one level and offers: panoramic views, 4 large bedrooms, three bathrooms, large dining room, fully equipped kitchen, lounge, large verandas and private swimming pool.This villa accommodates up to 9 people, it is 220 m2 in total. The archway House, is located 2,5 km out of Naoussa.The house is 180 sq.m, it has a private swimming pool and is positioned in 800 sq.m. piece of land. Has 3 levels, 3 bedrooms, 3 baths, a loft with two single beds and can accommodate 6 +2 persons. It`s overlooking Kolimbithres, one of the most exciting places of Paros, consisting of sculpture rocks and small beaches.